MOSCOW, Idaho – Some years, on teams laden with experience, spring football is an accurate prologue to the coming season. Roles are already set for key contributors. While spring is an opportunity to introduce newcomers to a team’s culture, for everyone else it is mostly about refining and building upon what they know they are going to be doing in September. That’s not the case for the Idaho Vandals’ offense. Spring practice this year is more like an outline than a prologue. Coach Paul Petrino knows what questions the Vandals charged with moving the ball need to answer, and those queries will be posed in the 15 practices that begin Monday. But definitive answers might not come until preseason camp. It could take until August for some things to finally sort themselves out. While “to be determined” might be the unsatisfying resolution to big issues facing the Vandals this spring as they transition from the Sun Belt Conference and the Football Bowl Subdivision to the Big Sky Conference and the Football Championship Subdivision, the questions will be introduced in April. 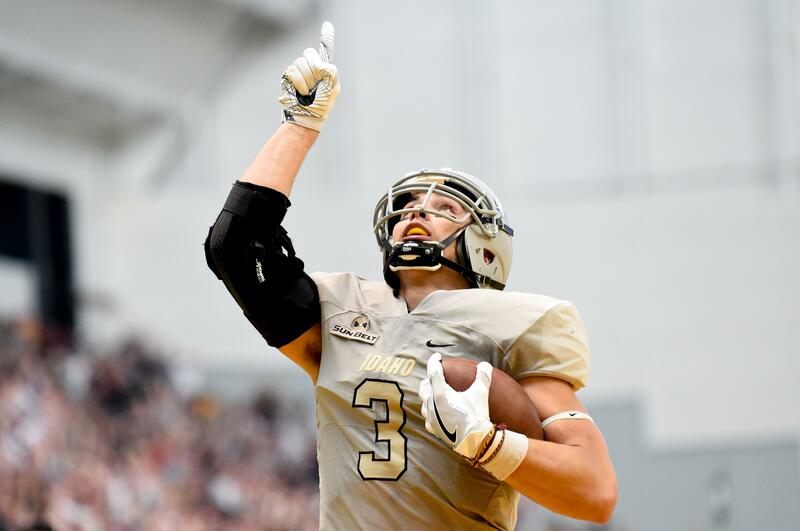 With the graduation of four-year starter Matt Linehan, Idaho must find his replacement. After Linehan missed the final three games last year with a hand injury, Mason Petrino got one start before he was also hurt. Freshman Colton Richardson lost his redshirt and played two games. He threw for 228 yards and a touchdown in Idaho’s final FBS appearance, a 24-10 win over Georgia State. Richardson, redshirt freshman Dylan Lemle, and Petrino, a junior who split time last season as a quarterback and wide receiver, are in the mix to succeed Linehan. Richardson’s big arm, and Lemle and Petrino’s ability to run as well as throw, will help each make his case to start, but Idaho coaches will also have to weigh who can lead. The quarterback is the face of a team and the Vandals no longer have the luxury of Linehan’s experienced leadership. An heir apparent will have to step up or coaches will have to believe there is enough leadership coming from elsewhere to allow a talented-but-inexperienced QB successor to grow into the position. The passage of time and a winter spent in Idaho’s conditioning program for returning players might have helped answer this. But Idaho’s young offensive line last year was dominated by defenders often enough that Petrino made strengthening the line a recruiting priority. Will junior college transfers Edwin Cortez Grande (291 pounds) and Bruce Burns and Brian Robinson, each about 345, stand out immediately as potential starters? Better yet from Idaho’s perspective, will overall line play be improved this spring to the point an offensive line rotation won’t be determined until August? Who steps up at receiver? The loss through graduation of Reuben Mwehla, Alfonso Onunwor and Academic All-America Jacob Sannon will open up opportunities for wide receivers. Senior David Ungerer caught 39 passes for 432 yards with six touchdowns last season. Jante Boston, a junior, played in 10 games and caught four passes. Two junior college additions, Ariyon Huff and Steavenson Fernand, are expected to challenge for playing time. Spring is a time for coaches to tinker. Even during last season, Kaden Elliss not only made 80 tackles as a starting linebacker, he caught seven passes as a tight end and slot receiver for 156 yards and two touchdowns, and he played on special teams. Seemingly every position coach was putting in a claim for some of his time. It will be interesting to see all the places he lines up for the Vandals this spring. While Idaho has much to determine on offense, on defense the Vandals are talented and experienced. Senior linebackers Elliss, Ed Hall and Tony Lashley might comprise the best linebacking unit in the Big Sky. Jalen Hoover, Dorian Clark and Lloyd Hightower all played extensively in the defensive backfield last year. Redshirt junior Denzal Brantley played only two games before being lost for the season with an injury. But the converted running back won a job as a starter at safety last spring and quickly became a force in the secondary. The strength at linebacker and in the secondary should give the Vandals stability as they rebuild the defensive line this spring. Published: March 24, 2018, 6:25 p.m. Updated: March 24, 2018, 11:13 p.m.